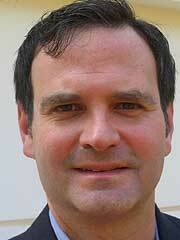 << Erik Curren, of Staunton, is the 20th District Democratic nominee for the state House of Delegates. “Our civil rights have no dependence on our religious opinions any more than our opinions in physics or geometry,” Jefferson continued. From this noble statute derives the freedom of all Virginians to follow the faith of their choice, or no faith at all, and to enjoy absolute protection under the law. Those who hold or seek public office in Virginia are likewise free from any religious test. It is my belief that faith is an issue between a person and his or her own heart. We should respect the rights of all citizens to approach this issue of conscience as a private matter, unless they choose to share their convictions with others. I have always been happy to talk with people who have a genuine interest in faith. In my life, I draw inspiration from many sources. These days, my weekly routine is filled with practices that come mostly from Christianity and Buddhism. I am moved by stories from the New Testament and by the revered music of the church, from rousing hymns to haunting spirituals. hospitals, schools and even churches across the United States. It is understandable that people are curious about and may even fear things they do not understand. So it is a service to civil discourse for people of different faiths to share their beliefs and practices in a spirit of mutual respect and tolerance. Recognizing that all major religions teach the same basic ideas — to seek truth, promote love and care for God’s creation — faith can be a way to bring us all together on a higher plane. But all too often religion is used by misguided leaders to pull our communities apart and to sow the seeds of discord. This is a misuse of religious faith in my opinion, and I feel compelled to speak out against religious prejudice and bigotry. So, to those who would court intolerance for political gain, I say: in America, you will lose. In Virginia, you will lose. And in the Shenandoah Valley and Highland County, you will lose. This accords with my own two decades of experience in this area. People here are independent thinkers who don’t want government or anyone else telling them what to believe. And I know from history that our mountains and valleys have long put out a warm welcome to people of many faiths, from Mennonites and Brethren to Roman Catholics, Jews and even deists in the style of Jefferson. Now we continue to welcome neighbors from even more religions, whether Hindus, Muslims or those who follow traditional African faiths. Over the last four months of my campaign, I have met thousands of voters across the 20th District. They have asked me many questions about the issues that matter to them: jobs, schools, transportation and quality of life. Very occasionally someone has asked me about my faith and we have had a candid discussion about it, including my belief that to draw from multiple traditions strengthens my faith life. These voters have seemed to care about the quality of the candidate, regardless of spiritual affiliation. My faith teaches that a worthwhile life is a life of service. For this reason, I feel akin to all those of faith who strive daily to serve their families and communities in many different ways. Our area is blessed with countless selfless people who give up their free time to sit on volunteer boards, who donate generously to food banks and who serve the public as teachers, social workers and health care professionals. My campaign will be inspired by these citizens who open their hearts in compassion to their neighbors regardless of faith, race or political affiliation. And if elected to represent the 20th District, I promise to follow the example of my many selfless neighbors. At the same time, I will always stand against bigotry and prejudice. And I pray that I will never fail to speak out for freedom, tolerance and mutual understanding.